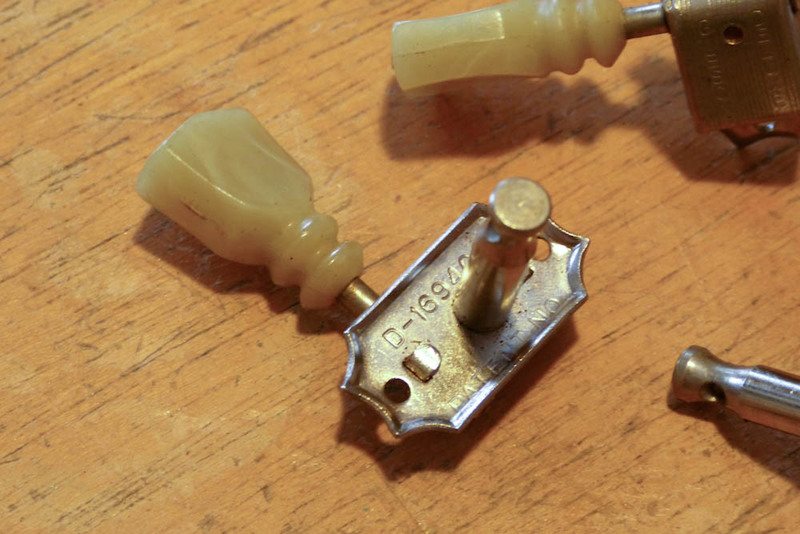 A friend of mine recently brought in a 60s Kay archtop (destroyed) that, surprisingly, had these parts on them. 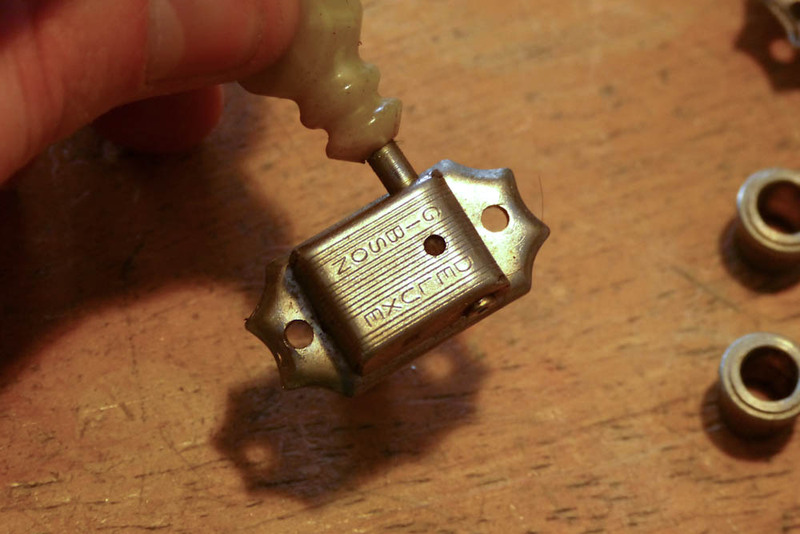 This first piece is a combination tailpiece and bridge as seen on Gibson ES-225s and also early Les Paul models. The screws and tailpiece/bridge itself is original but I've cobbled together some new adjustable "legs" since the originals were missing. 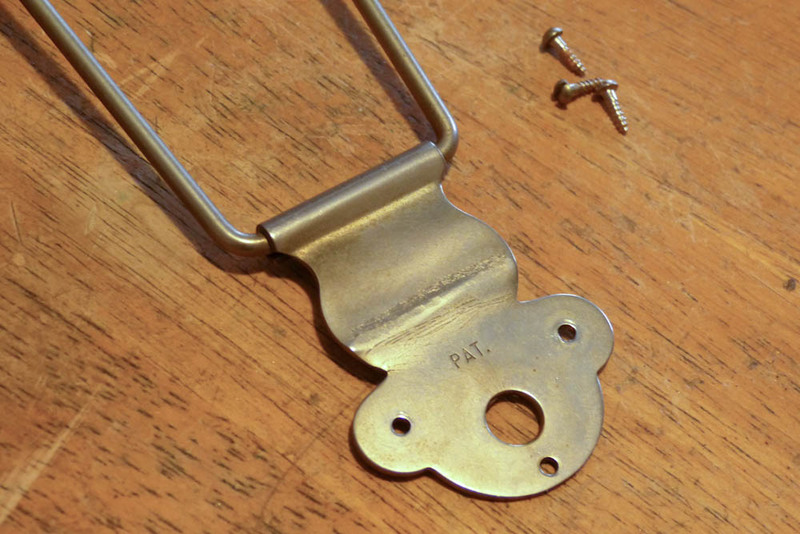 Patent stamp on the tailpiece. 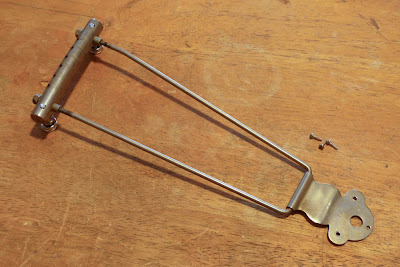 Note that I'm not sure but I think this tailpiece hanger was "flattened" at the usual "hinge" area. This can be knocked back into an angle but I'll leave that to the new owner. The original nickel-plating on the tailpiece is a little tarnished but looks nice. Strings mount through the front, here, then wrap up and over the compensated top. 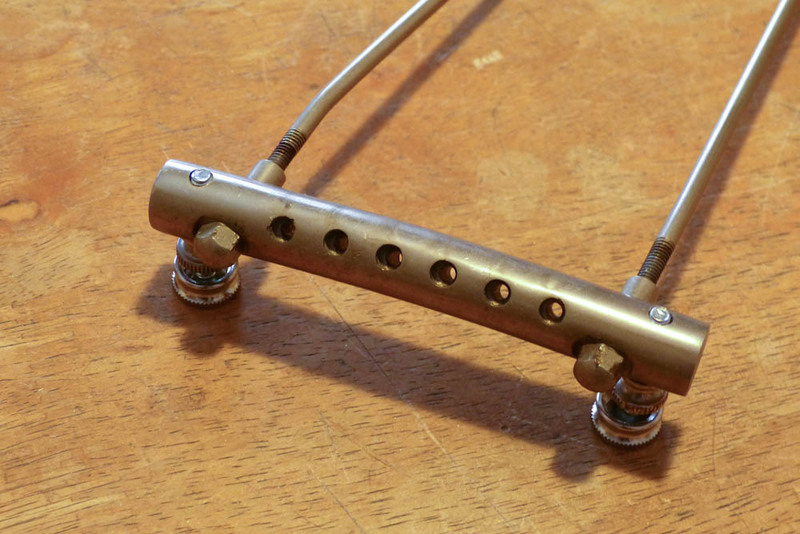 The arm length of this tailpiece is roughly 8 1/2" to 9" and adjustable. With the bend "bent back out" at the hanger you could get about an extra 3/8" to 1/2" of use. Here's my solution to the missing bridge feet... and it works! 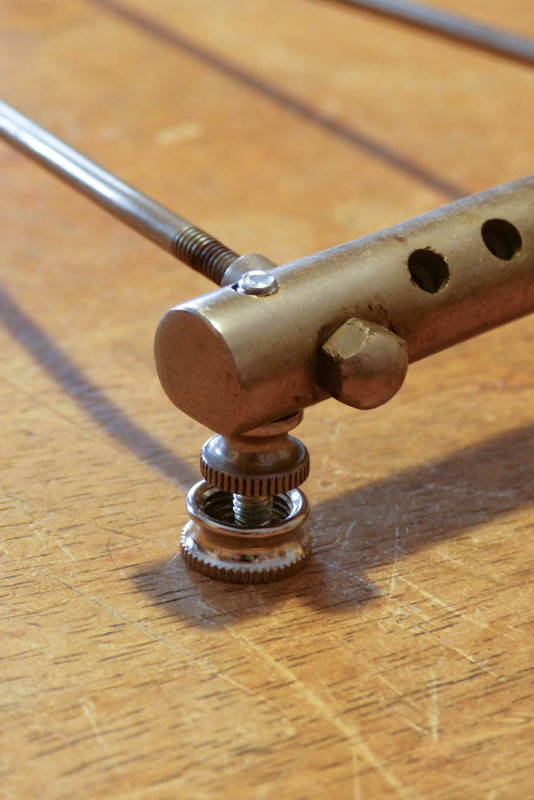 This would probably need to be modified for a Les Paul-style top to get the height just right, though. 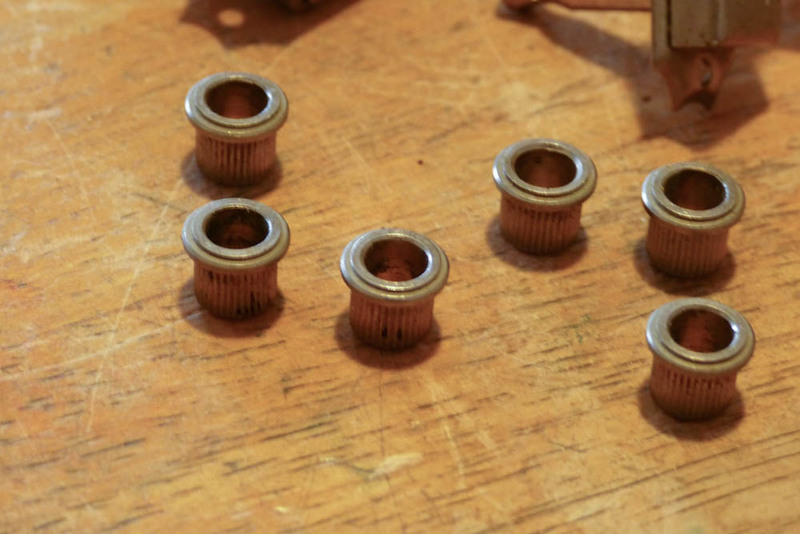 All that would need to be done is to cut down the length of the bolt threads. 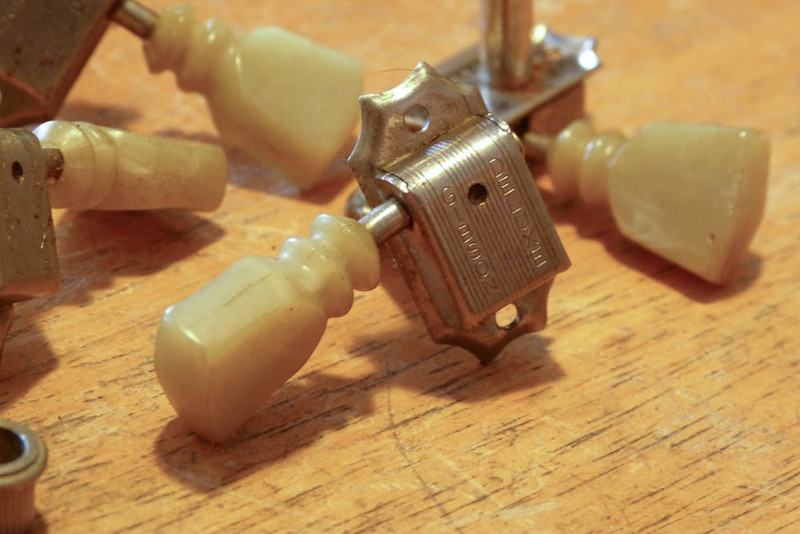 ...and here's a full set of late 60s, early 70s Gibson Deluxe Kluson-made tuners. These are called "double ring" types because the greenish keystone buttons have two "rings" at the bottom rather than the more usual one. They're all in good shape and they work just fine but one button shaft has a small bend to it. Typical patent stamp on the back. 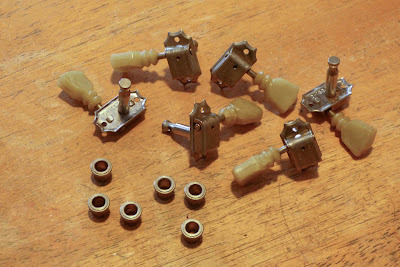 Complete ferrule set, but no original screws. Here's the "double line" Gibson Deluxe script.